ENG (for German Bio please scroll down). 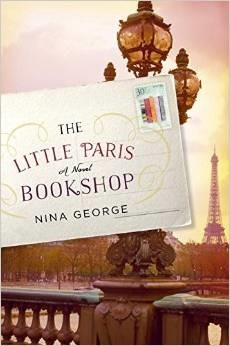 Born 1973 in Bielefeld, Germany, Nina George is a prize-winning and bestselling author (Das Lavendelzimmer The Little Paris Bookshop) and freelance journalist since 1992, who has published 26 books (novels, mysteries and non-fiction) as well as over hundred short stories and more than 600 columns. George has worked as a cop reporter, columnist and managing editor for a wide range of publications, including Hamburger Abendblatt, Die Welt, Der Hamburger, politik und kultur as well as TV Movie and Federwelt. Georges writes also under three pen-names, for ex Jean Bagnol, a double-andronym for provence-based mystery novels. In 2012 and 2013 she won the DeLiA and the Glauser-Prize. In 2013 she had her first bestselling book Das Lavendelzimmer, translated in 27 langues and sold more than 500.000 copies. In November 2011, Nina George established the JA zum Urheberrecht (YES on Authors Rights) initiative, which supports the rights of authors, artists and entertainers and is dedicated to resolving issues within the literary community as well as establishing fair and practical rights-license models for the web-distribution. 14 writers associations and 27 publishing partners have since joined the JA-Initiative. George supports the Initiative Urheberrecht (Authors Rights Initiativewww.urheber.info) as well as the gib 8 aufs Wort-campaign of the VG Wort. In August 2014 George initiated the Amazon-protest in Germany www.fairer-buchmarkt.de, where overs 2000 germanspeaking authors Nobelprizewinnig Elfriede Jelinek or Bestsellingauthor Nele Neuhaus sign an open letter to Jeff Bezos and Amazon, protesting against the banned-book-methods of the giant retailer in the Hachette/Bonnier-dispute. In 2015 George is the founder of the Initiative Fairer Buchmarkt e.V., which supports questions of law in daily business of authors for ex in contracts, fees or authors rights and e-Business. George is Member to PEN, Das Syndikat (association of German-language crime writers), the Association of German Authors (VS), the Hamburg Authors Association (HAV), BcherFrauen (Women in Publishing), the IACW/AIEP (International Association of Crime Writers), the GEDOK (Association of female artists in Germany), PRO QUOTE and Lean In. Nina George sits on the board of the Three Seas Writers and Translaters Council (TSWTC), whose members come from 16 different countries. Nina George teaches writing at Literaturbro Unna, Alsterdamm Kunstschule, Wilhelmsburger Honigfabrik, where she coaches young people, adults and professional authors. George also moderates (bilingual) readings and works as a speaker. Die mehrfach ausgezeichnete Publizistin Nina George, geboren 1973, verffentlichte bisher 23 Romane, Krimis, Science-Thriller sowie ca. 88 Kurzgeschichten und ber 500 Kolumnen. Ihr Pseudonym Anne West gehrt zu den erfolgreichsten deutschsprachigen Erotika-Autorinnen. Fr ihren Roman Die Mondspielerin wurde George mit der DeLiA 2011, dem Literaturpreis fr den besten Liebesroman des Jahres, ausgezeichnet. Mit dem Wendekrimi Das Licht von Dahme war George 2010 fr den Friedrich-Glauser-Preis nominiert. Sie gewann ihn 2012 mit dem in Nigeria angesiedeltem Fuballkrimi Das Spiel ihres Lebens. George grndete 2011 die Initiative JA zum Urheberrecht, mit der sie sich aktiv fr die Rechte aller Kreativarbeiter und Kulturschaffenden gegen die Mentalitt der Gratiskultur im Internet einsetzt. Sie ist Mitglied im Syndikat, den Mrderischen Schwestern sowie des Verbands deutscher Schriftsteller. Nina George lebt im Hamburger Grindelviertel.